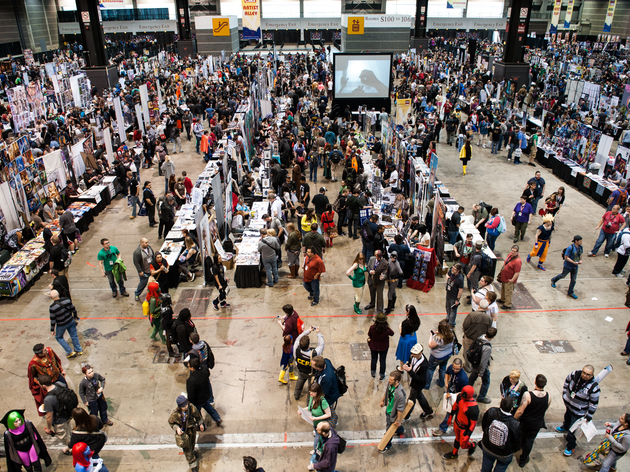 Photograph: Max Herman Costumed attendees flock to McCormick Place for the Chicago Comic and Entertainment Expo (C2E2). El stop: Green to Cermak-McCormick Place. Bus: 3. Train: Elec Main to McCormick Place. 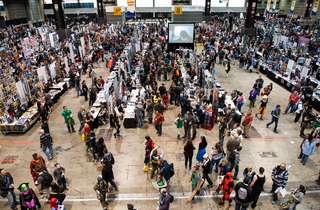 I visited McCormick Place for C2E2 in mid-March. It was packed full of superheroes, then, but I still fount the large sprawling center to be very lovely. The views of Lake Michigan are quite nice as well. The space is vast and there are waterfally-like fountains and flowers all over the interior. I did not make use of any food vendors while there however I did try a bathroom or two and found them to be a little small to accommodate large crowds. Hopefully I have a reason to get back sometime soon.